Ever get confused about why a guy isn’t texting you back? Ever freak out and wish that he would just respond to your texts? Basically, have you ever wished that texting guys was just simpler? Relax, because now it is. Take this quiz and find out Why Isn’t He Texting You Back? 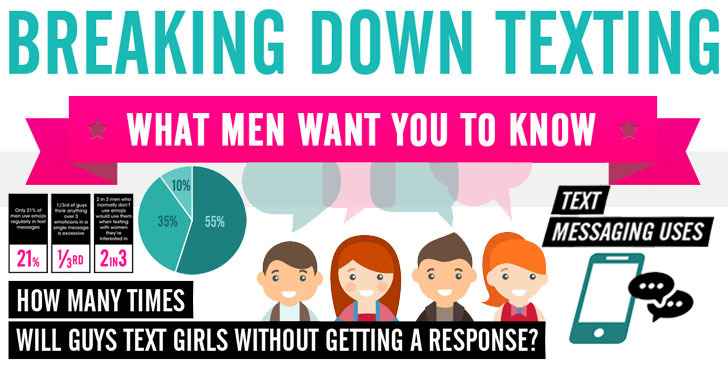 We surveyed thousands of guys on their preferences about texting and broke them down into one awesome and easy to read infographic. Guys gave their completely honest and 100% uncensored opinions about what REALLY bothers them about texting with a woman, why they suddenly stop texting back… and what they wish women did more of. You can scroll through this infographic and find out for real exactly what men wish you would do. It has everything you could possibly want to know about guys and texting that will clear up all the confusion and make texting the guy you like easy and fun, like it’s supposed to be. But what if you could take a quiz that gives you the real answer on why he didn’t text you back? Take The Quiz: Why Didn’t He Text You Back? wish to know more about women how they react to guys text.